Deng Xiaoping with President Ford and George H. Bush George H.W. 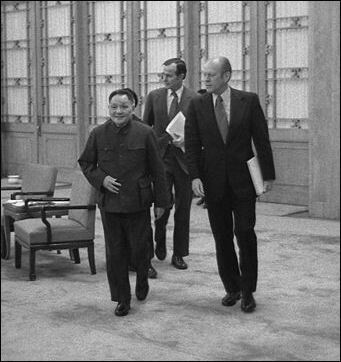 Bush served for 14 months in 1974 and 1975 as the chief U.S. liaison officer to China. Bush kept himself busy with embassy receptions, encounters with Chinese bureaucrats and a handful of meetings with senior officials such as Deng Xiaoping. Most significantly, he and his wife Barbara took regular bicycle outings to get to know ordinary Chinese. Andrew Higgins wrote in the Washington Post, “In 1985, American vice president George H.W. Bush visited the western Chinese city of Chengdu and the told Chinese there that America wants to help them. In a speech to students from Sichuan University, Bush said the United States would allow China access to a far greater range of American technologies - some with military applications -- than other communist countries were granted. American firms, he said, were eager to invest in China. American consumers, he predicted, would soon hanker after Chinese goods. "We are interested in helping China," Bush told his audience. "Very, very, interested."... In 2011, American vice president Joe Biden addressed students at the same university, in the same city. Only this time, the message was completely different. Instead of promising markets, investment and technology, Biden pledged that the U.S. Treasury would make good on the trillion bucks it owes Beijing. When George H. W. Bush visited China in 1989 Chinese security prevented a dissident physicist from attending a state banquet. Bush infuriated China when he paved the way for Taiwan to buy F-16 warplanes. Bush was unable to talk with Deng Xiaoping by phone as the current U.S. president is able to do with Hu Jintao. He had hoped the personal contacts he made with Deng in the 1970s would help him while he served as president but that was largely not the case. Those contacts didn’t amount for much during the Tiananmen Square crackdown which occurred under senior Bush’s watch. Clinton with Jiang Zemin On China, U.S. President Clinton criticized the Bush Administration before him of "coddling to dictators” In 1992, he said that he opposed Most Favored Nation status for China on human rights grounds while Republicans advocated of policy of trade and investment. Later the two sides switched their positions. 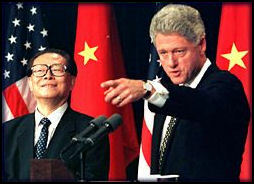 When Clinton visited China in 1998 he became the first U.S. president to visit China since the Tiananmen Square crackdown. Clinton criticized the crackdown; Chinese President Jiang Zemin defended. It. During Clinton’s term China protested when Taiwanese leader Lee Teng-hui was granted a U.S. visa in 1995 and Jiang became the first Chinese leader to visit the United States in 12 years, in 1997, and NATO planes bombed the Chinese embassy in Belgrade. Unable to resolve the question in 1995 on whether to invite Jiang Zemin to a "working lunch" with a 19 gun salute or a state dinner with a 21-gun salute, President Clinton decided to meet with the Chinese leader at the celebration 50th anniversary of the United Nations in New York. The Clintons served chilled lobster and pepper-crusted Oregon beef at the 1997 dinner for Jiang Zemin. The Bush administration used words like “containment,” “balance” and “hedged integration” to describe their policy towards China. It accused China of backsliding on its human rights commitments and creating tensions in Asia by beefing up its military. Conservatives that support Bush were particularly upset by the treatment of Christians in China. U.S. President George W. Bush visited China in October 2001 and met with Chinese President Jiang Zemin. He returned again in February to mark the 30th anniversary of Nixon’s trip. Jiang visited Bush’s ranch in Texas in October 2002. When Chinese Premier Wen Jiabao visited the White House in 2003, Bush publicly accused Taiwan of provoking Beijing. Bush first visited China in 1975 when his father was the chief American representative to the country after Prime Minister Nixon’s opening to the Chinese. He was struck by the multitude of bicycles and how people dressed so much alike and had a tooth fixed by a dentist for 60 cents. After September 11th, relations between the United States and China became warmer. The two countries cooperated in terrorist issues. The United States has relied on China to help get North Korea to make concessions. In March 2004, the United States introduced a resolution condemning China for human rights abuses. China responded by suspending human rights talks with the United States for seven months. In April 2005, it was announced that the United States and China agreed to hold regular senior-level talks. The crisis over EP-3 plane was defused by two weeks of diplomacy led by Secretary of State Colin Powell and his deputy Richard Armitrage. The Bush administration made an effort to keep communication channels with China open though its Strategic Economic Dialogue and a similar military organization. Bush visited China in November 2005 and failed to make progress resolving differences between the United States and China on issues such as intellectual property rights, the trade gap, currency controls, and religious freedom in China. During the trip Bush lectured Chinese leaders on the value of freedom and made a point of attending a state-controlled Protestant Church for a Sunday morning service. U.S. Secretary of State Condoleezza Rice did the same on an earlier visit. 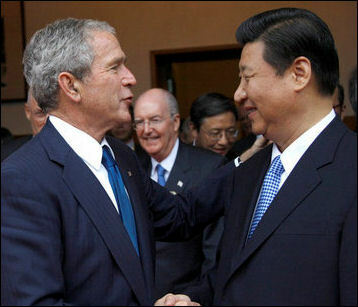 Bush and Hu met five times in 2006, mostly at international meetings such as the APEC and the G-8 meetings. Their relationship was described by the Bush administration as strong. Hu visited the United States in April 2006, referring to it as a meeting between the word’s largest developed country and the world’s largest developing country. He had dinner at Bill Gates’ $100 million home; visited a Boeing factory; and approved $16 billion worth of deals with Microsoft, Boeing, American automakers and other U.S. companies. Hu visited Washington in 2006 but was denied a full state visit. Evan Osnos wrote in The New Yorker: “Hu Jintao has always wanted to be asked to dinner in Washington... George W. Bush refused. 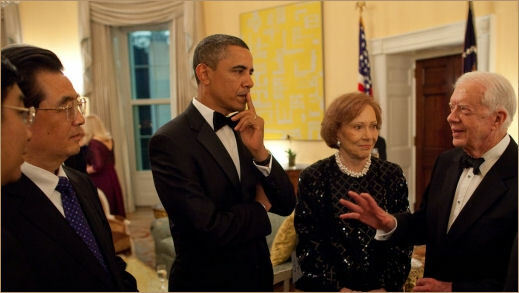 Instead, he offered Hu lunch---halibut, to be precise---to reflect Bush’s displeasure with China’s human-rights record. Hu, it was later discovered, considered Bush’s lunch to be the Presidential equivalent of a white-glove slap across the nose...Adding to the foul mood on that trip, Hu was treated to a couple of screw-ups that diplomats in Beijing perceived as deliberate, or, at a minimum, careless: The White House announcer heralded the nation as the “Republic of China,” a.k.a. Taiwan, and a Falun Gong protester heckled Hu from the press riser for several minutes while the Chinese president stood awkwardly. During his White House visit Hu was given a 21-gun salute at a welcoming ceremony but was also subjected to heckling from a Falun Gong protestor. Bush personally apologized for the incident in which the female protester shouted to Bush to stop the Chinese president from “persecuting the Falun Gong.” The protestor gained access to the event with press credential given through a Falun Gong newspaper. Five years earlier she had heckled Jiang Zemin during a speech in Malta. There were other gaffes, The Chinese national anthem was announced as “the national anthem of the Republic of China”---the official name of Taiwan---and Bush awkwardly tugged on Hu’s sleeve when Hu started walking down the wrong steps after finishing his speech. In his speech Bush rattled off a long list of demands on problem like trade, counterfeit goods, human rights, North Korea and Iran. Xi Jinping with George W. Bush The 9-11 attacks gave the United States an opportunity to seek China as an ally in the war against terrorism and get its help dealing with troublesome nations such as Iran and North Korea. The Bush administration was thankful that China did not make much fuss about the invasion of Iraq and has said that China’s help was essential for making progress with North Korea. The Bush years were generally a boon for China. The wars in Iraq and Afghanistan kept the United States distracted allowing China to quietly spread its influence. The wars gave the United States a bad boy image and made China look generous and humanitarian in comparison. Although Bush met with the Dalai Lama and urged more religious freedom in China, he generally did not press China too much on human rights issues and hardly pressed them at all on global warming and environmental issues. 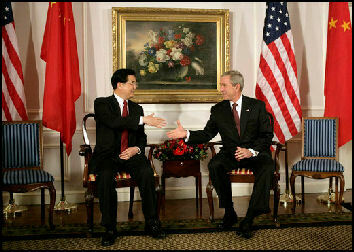 Under Bush the relationship between China and the United States was based on mutually beneficial economic interests. Bush has said that he has talked candidly with Hu Jintao about human rights, particularly religious freedom. He shared his own religious beliefs with Hu and his predecessor Jiang Zemin and urged the Chinese to lift restrictions on underground churches. The Bush administration for the most part chose to press China privately on the Tibetan issue rather than make bellicose public statements about it. Bush attended the Opening Ceremonies and a number of events at the Beijing Olympics, making him the first sitting president to attend an overseas Olympic Games, and said the Olympics was not the forum to criticize other nations on political issues. Even so he attended the opening of a new U.S. embassy in Beijing and talked about the importance of free speech and met with Hu Jintao after praying at an authorized church in Beijing. Mainly though he kept to his word that he was in Beijing to cheer American athletes and show his “respect” for the Chinese people. At the Opening Ceremonies he had a brief chat with Russian Prime Minister Vladimir over Russia’s invasion of Georgia. Bush welcomed five Chinese dissidents---Wei Jingsheng, a democracy activist; Harry Wu, a Chinese prison critic; Sasha Gong, a Chinese writer imprisoned in China in the 1980s; Bob Fu of the China Aid Association, a Christian rights group; and Rebiya Kadeer, an Uyghur activist---to the White House and “assured them that he will carry the message of freedom as he travels to Beijing.” Around the same time the U.S. Congress passed a resolution urging China to honor its pledge to improve human rights before the games. On October 2008, China said it was upset by the announcement that the United States would go forward with the $6.5 billion arms package deal to Taiwan that included 30 Apache helicopters, submarine-launched anti-ship missiles, and 330 Patriot missiles, saying it would hurt ties between China and the United States To protest the proposed sale the Chinese government canceled or postponed several military exchanges. Hu Jintao in the U.S. Shortly after taking office, U.S. President Barrack Obama vowed t to take relations with China to a new level. He named China a “strategic partner” instead of a “strategic competitor”---the label it had under the Bush administration.The Obama administration has pressed China more on global warming and environmental issues than the Bush administration did. It has backed off a little on human rights. During a meeting in New York in September 2009. Obama asked Hu for help in Iran and North Korea. There seemed to a sort tacit agreement that China would do what it could on these issues in return for the U.S. backing off on human rights issues and Tibet. The United States and China held joint counter-terrorism talks. They worked together on the North Korea problem and the global economic crisis. Some critics accused Obama of caving in to China on Tibet when he initially failed to meet with the Dalai Lama and on global warming when he failed to get Beijing to make significant concessions on global warming. In February 2010, Obama met with the Dalai Lama despite a harsh warning from Beijing. In a speech in December 2009 Clinton said in a speech at Georgetown University that human rights and democracy promotion were essential parts of U.S. foreign policy, a comment that to be addressed to those who thought the Obama administration was too soft on human rights in China. In January 2010, the Obama administration angered Beijing by approving a $6.4 billion weapons sale to Taiwan, which included 60 UH-60 Black Hawk helicopters, 114 Patriot Advanced Capability missiles, mine hunter ships and advanced communications equipment but did not include the F-16 jets that Taiwan really wants and had been promised but never delivered in past Taiwan-U.S. deals. China responded to the sale by suspending military exchanges and threatening sanctions against U.S. defense companies. 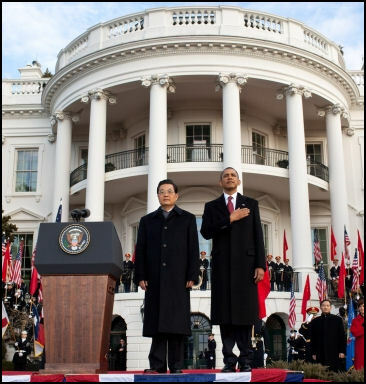 Obama bowed to Hu Jintao on a couple of occasions. During Obama's visit to China the Chinese disrespected Obama by blocking broad news coverage of his public speech and later, in December, sending low level officials to negotiate with him at Copenhagen global warming meeting until the last minute when Premier Wen Jiabao finally granted him an audience. Jons Huntsman, a former governor of Utah, was appointed the ambassador of China by Obama. Huntsman stepped down in the spring of 2011. In June announced he was running for U.S. President as a Republican candidate. Obama visited China and met with Hu Jintao in November 2009. The two leader emerged from a series of tense meetings, according to new service reports, saying the two countries were united in tackling important issues such energy, global warming, Iran and North Korea but disagreements still remained on trade, currency, security and human rights issues. During his four days in China Obama publically stressed common goals shared by China and the United States, urged greater dialogue between the two nations, participated in a live webcast town hall meeting before a handpicked group of university students and visited the Forbidden City and the Great Wall of China. He returned home with no great policy breakthroughs or achievements. Some American pundits criticized him for being too accommodating, even kowtowing, to Beijing. Overall, Obama didn’t seem particularly well-prepared and seemed distracted by more pressing issues like health care at home. Michelle and the kids didn’t join him. In the summer of 2010 the Obama administration began taking a tougher stance with Beijing: rejecting China’s sovereignty claims to the South China Sea; rebuffing demands that the U.S. end its long-running military exercises in the Yellow Sea; and warning China not jump into Iran to take advantage of Western firms leaving. China responded with almost a scripted rebuff of its own, saying the United States was trying manipulate and contain it, and then started to be nicer to Washington when it began attacking Japan. In January 2011, Hu visited Washington for a high-profile summit. He had a red carpet rolled out for him and was greeted by Vice President Joe Biden at the airport. Highlights of the visit included a private dinner with Obama one night and a big state dinner the next. As a gift Hu gave Obama a $20,000 silk embroidery of the first family. When Obama toasted Hu he quoted a Chinese proverb that says if you want to build a hundred years, invest in people. In conjunction with the visit China unveiled a sixty-second video titled Experience China . Calling it “the national equivalent of an online-dating ad” and projected on a series of whopping screens on Broadway, Evan Osnos wrote in The New Yorker, “It will be shown fifteen times an hour, twenty hours a day for the next three weeks. The ad consists of a cycling series of images of China’s big names, including Yao Ming, Internet entrepreneur Robin Li, astronaut Yang Liwei, and pianist Lang Lang. That would be fine, but, regrettably, the images are paired with text that hails “Chinese Bravery,” “Chinese Space Travel,” Chinese Friendship,” and “Chinese Wealth.” At a moment when Americans are talking about little more than job growth, the latter, “Chinese Wealth,” has not been received in the spirit with which its sponsors intended. The Obamas opted against bringing in a high-profile guest chef, instead putting White House Executive Chef Cristeta Comerford in charge. On the menu: d'anjou pear salad with farmstead goat cheese, poached Maine lobster, orange glazed carrots and black trumpet mushrooms, dry aged rib eye with buttermilk crisp onions, double-stuffed potatoes and creamed spinach. Dessert was to be old-fashioned apple pie with vanilla ice cream. One her first visit to China in 2009, U.S. Secretary of State Hillary Clinton broke tradition by bluntly admitting she expected to make little progress on human rights issues, saying she would raise human rights issues “but we know pretty much what they?re going to say.” Human rights groups condemned her candor, saying it was important to keep sustained pressure on China. Clinton nevertheless insists she is committed to improving human rights in China. On her trip she attended services at a state-run church, told people on web chat to speak out and met with women activists---but said there no reason to avoid stating the obvious. In August 2011, U.S. Vice President Joe Biden visited China for five days. . He visited a school in Dujiangyan, where residents were recovering from the devastating 2008 Sichuan earthquake, and attended a basketball between American and Chinese teams. He brought up the issue of human rights during a speech to 400 people at Sichuan University and pledged that the U.S. Treasury would make good on the $1.2 trillion bucks it owes Beijing. That follows the months-long suspension of military contacts last year following the announcement of another arms deal for Taiwan. China views such exchanges as a political bargaining chip, frustrating U.S. officials who say they are important in building confidence and avoiding confrontations as China's military modernizes. Chinese vice president and future leader Xi Jinping was expected to make an important visit to Washington in coming months but no specific dates have been announced. There have also been calls in the media and among the military for commercial reprisals against companies involved in the upgrades, but China's own fledgling commercial aerospace and other high-tech industries rely heavily on American technical expertise. “The U.S. government has to come to terms with the painful fact that the good old days when it could just borrow its way out of messes of its own making are finally gone,” read the commentary, which was published in Chinese newspapers. Beijing, which did not release any other official statement on the downgrade, called on Washington to make substantial cuts to its “gigantic military expenditure” and its “bloated social welfare” programs. The commentary serves as a sharp illustration of how America’s standing in the world is sliding and that China now views itself as ascendant. While Washington wrangles over its debt and deficit problems and the European Union struggles to deal with its own debt issues, China is sitting on the world’s largest foreign exchange holdings and its economy is growing at close to 9 percent. The country is also once again racking up huge trade surpluses with the rest of the world. Beijing does have its own worries, such as soaring inflation and housing prices and trying to cool off an over-heating economy. Policy makers are also trying to deal with the accumulation of huge foreign exchange holdings tied to its trade and current account surpluses. Over the weekend, China blamed "shortsighted political wrangling in Washington" for problems threatening to upend the global economy. An I-phone photo in 2011 of Gary Lock, U.S. ambassador to China, carrying his own backpack and ordering his own coffee at an airport caused something of an Internet sensation in China when it was posted on a social networking site, raising question about why Chinese official couldn’t act with same frugality . The person who took the picture of Locke, the first Chinese-American ambassador to China and a former governor of Washington state, said Locke tried to use a coupon but was was rejected. Among the thousands of comments on the social media network Sina Weibo were ones like this. "This is something unbelievable in China...Even for low-ranking officials, we don't do things for ourselves. Someone goes to buy the coffee for them. Someone carries their bags for them." The Wall Street Journal reported the response so far among Chinese Internet users: Bring it on. "To be honest, Im' looking forward to being colonized," a user of China's popular Sina Weibo microblogging service writing under the name Yan Luantong commented Tuesday. "We welcome this kind of Oneo-colonialism” with open arms!!!" added another user, Liu Xiaodong.